The Pro Sect quarter scale with integrated protractor. The simplest, easiest to use and most accurate quarter scale to layout balls. 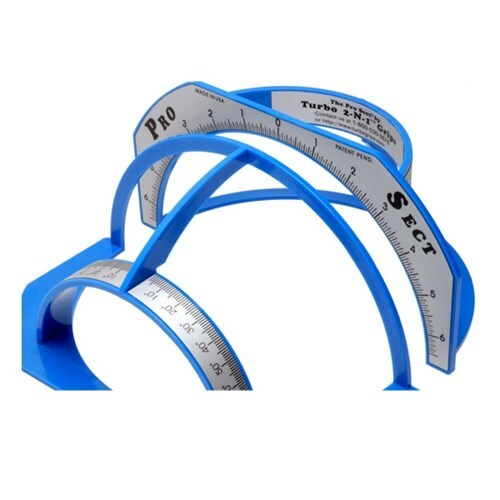 The Pro Sect features a labeled 180 degree protractor to indicate degree of angle for oval hole cuts and oval thumb insert installation and an easy to read ruler designed in 1/16" increments spanning the diameter of a bowling ball. Its intersection-molded design maximizes durability and assures the accurate layout of straight and perpendicular lines. Available in assorted colors (chosen at random). Indicate which color you would like in the comments section on the final checkout page. By Dennis from Redding Ca. Due to the time it takes to produce the Turbo 2-N-1 Grips Pro Sect Quarter Scale ball it will ship in immediately. We cannot ship this ball outside the United States.